These are some of the birds that are apart of my family. We have more on our breeders page. 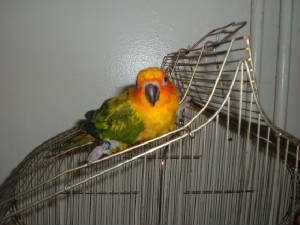 This is my Sun Conure named "Spazz". 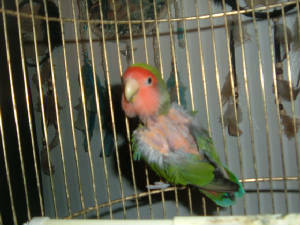 This is a baby of "Sunny and Cher" which they are on our breeders page. 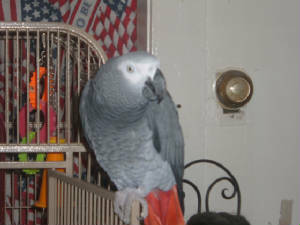 This is my husbands Congo African Grey "Otis". We were told Otis is a male and is 5 years old however we don't really care because he's not going to be a breeder he's more into being a pet.I do hope to get a pair of Congo's though. This is "Pettie".He does not want to be with a mate or be handled he's just a loner.He has a wild side to him though yet I think it's all an act.My husband has held him however he's very cage territorial.He has been plucked since we had gotten him and will not grow any feathers.That's ok because we love him just the way he is.